This robustly constructed model combines excellent stability, with precise control, and is ideal for a wide variety of imaging equipment. Comfortably manages all Spotting Scopes and Observation Binoculars of up to 100mm Diameter. Can be used effectively indoors, or in the field. Recommended for Serious Nature Observing, Astronomical Observing and Video applications. 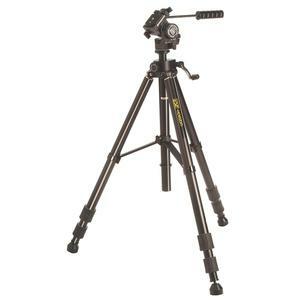 Further to my last review I would confirm the following the the tripod.&nbsp;HEAD: Started to have movement in that the head would rock backwards. The issue has been raised on other sites. However , I found that if I turn the head clock wise slowly everything tightens up and no movement can be detected.&nbsp;Hope this helps other users if they had the same problem. Otherwise please with my purchase. I acquired this tripod for use with my Hawke Spotting Scope. For the money the Tripod is very good value for money and does appear well made but time will see if if i am correct.&nbsp;Smooth operation through out is a real bonus.